Ever since my conversion began back in 1998, I have been struggling with the idea that I could somehow be a mom and faithful to our Lord as I have been called. Last night as I was washing dishes I realized just how seriously under attack I had been over the years by the evil one, and still am. I learned last night one of the most evil things to ponder is, “If I would have” or “I should have never” in regards to setting my life completely on religious life, rather than on the family I have been blessed with, all leading to ponder regrets. I have been plagued by this thought since the beginning, only now realizing this is not the voice of our Lord. This is the voice of the Culture of Death saying don’t have children, pursue YOUR selfish wants. Take care of YOU first. It’s no different then the woman who puts off marriage and children to advance her career to become something other than what she was created to be. Constantly chasing after that carrot on the stick that she could never get to take a bite of because as you move forward, the stick carrying that carrot, moves at the same pace. Leading us to haul a bigger cart of misery and regrets, “Oh if I had married that man who loved me I would have a family by now”. Our Lord never moves the goal posts. He moves the players to enable them to score the touchdown. The evil one constantly moves the goal posts making it impossible to score, no matter how much effort you put into the play. You could be wide open, receive the ball and just about to cross the goal and with every step, the goal becomes further and further out of reach. In the end, you never score. No matter how many times you try. The gift of my family and the vocation of Marriage and Motherhood, is what needs to be placed first and when we place them above what we are searching for, and place ourselves last, we quickly understand our Lord is present in our own homes, waiting for that hug, to be tucked into bed, to be told to brush teeth and to pray with. Every action that has been done to pull closer to our Lord outside of the home, is brought into the home to be shared so in turn they can share it with their children. In all religious communities, the soul seeks to live in communion with others, seeking the same goal, to score one for our Lord. Its teamwork on the spiritual level and the hardest part of this Vocation of Marriage and Motherhood, outside of the Religious Life, is knowing without a doubt we are all on the same team, and our goal is to ensure, not that I score the touchdown, but that the one of us does, so we all give the glory to God. Not to live and play on the team of the Culture of Death, where life is frowned upon, but rather the Culture of Life, to allow all God’s creation to continue. Thank you Mama Mary, Queen of Heaven, on this day of your Nativity for this day to understand that we all have a bigger role to play in God’s plans and with humility and casting away self, to raise the next generation, allowing us to see life through His eyes and understand the smaller we become, the bigger the plans He has for us. I ask you to cover all mothers with your mantle, that they may be guided by your perfection in all motherly ways. 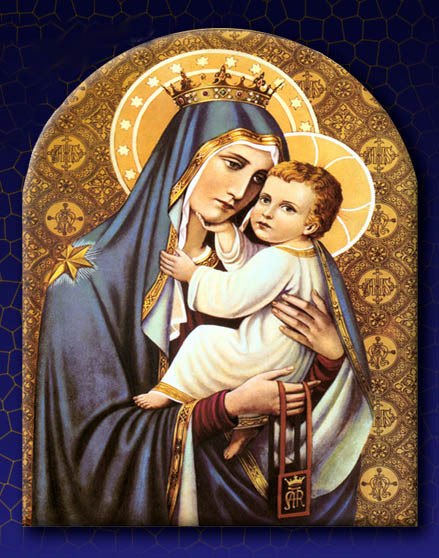 Our Lady of Mount Carmel, pray for us. Sacred Heart of Jesus, have mercy on us all.